I Already Volunteer, How about You? I wanted to tell you about an amazing project I am a part of: Across the country, there are more than 50 Ezer Mizion “What’s Up” groups, in which car owners are asked to offer their volunteer assistance in transport services, giving people a lift to hospitals around the country (when they are anyway on the way out of the city or back to the city, offering them an unusual, “no-sweat” chessed opportunity). There are already some 1500 volunteer members in these groups, who are privileged to help dozens of people every day, at the average count of 500 cases a week!!! In these groups, exchanges are carried out for this purpose alone, without any idle chatter, all in order to maintain the momentum and attract more chessed-seeking drivers who want to offer their help without unwanted interruptions. 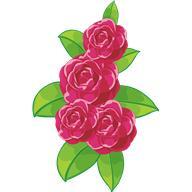 To join a group in the Ayalon region, send a message to Yehuda Mizrachi 054-817-7253. From my place at the steering wheel, I glance at his image in the mirror. He sits there, limp and helpless, his head dropped back against the seat. His voice is soft, almost a whisper. 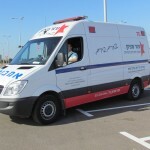 The vehicle, a modern Ezer Mizion ambulance, pulls up by a tall building. “Are you okay?” I ask the closed eyes behind me. He thanks me profusely for the ride, takes a deep breath, and steps out to the broad sidewalk. The street is humming with people at this midday hour: Children are coming home from school, cheery preschoolers prance along with their colorful backpacks, busy parents rush along their way. A cat darts out from between the cars, startling a high-school girl leisurely walking home. The young man continues along the path to the building. He stops a moment and glances at a large public bulletin board displaying freshly-pasted death notices announcing the demise of a special member of the community. He scans it silently. I watch him and feel a stab of sadness, painfully aware of the thoughts running through his mind. Snow is a way of life for many people. Only a few inches? Ho hum. 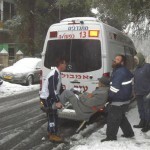 But in Israel it is a momentous event with schools closing and roads closed for even a relatively small amount of snow. For children, it is the ultimate delight. Even parents join them in their frolicking. But the disabled who has an important doctor’s appointment, the dialysis patient who is due at the clinic that day, the frail, elderly holocaust survivor who needs to see his physician today—they are helpless without the assistance of Ezer Mizion’s Ambulance Division. Continue reading A Snow Day? Who open the door to every request, and help out each one in the best possible way. Passing the various interchanges, crossing busy intersections.